Last week, as we reported, a Somali asylum seeker stabbed a doctor in the rural town of Offenburg in front of his 10-year-old daughter and many people attended a protest organized by the rightwing AfD near the town hall over the weekend. The leftwing Die Linke even organized a counter-protest but given the mass grief over the death of the beloved town doctor, all remained calm. 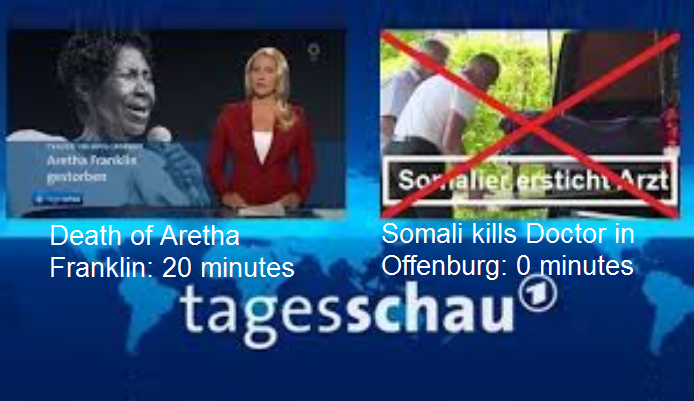 Of all these events, you could only find video reporting online or in the Bild tabloid newspaper (still the biggest newspaper in Germany) as national news seemed to omit the events on TV. Related coverage: <a href="https://thegoldwater.com/news/34132-Germany-Offenburg-Doctor-Killed-In-Front-Of-Daughter-10-By-Somali-Asylum-Seeker-26">Offenburg doctor killed in front of daughter by Somali asylum seeker</a>. Many Germans wrote to national broadcaster ARD and asked them why reporting on the Offenburg murder was not shown on the most important national TV news shows. The head of the national broadcaster who produces the program called the “Tagesschau”, Mr Gniffke, responded in a blog post over the weekend in a piece entitled: “this is why we don’t report on the Offenburg murder,” after he admitted ‘several’ people had contacted them asking why the case was not being reported. “Should the media report a murder case if the suspect is an asylum seeker? In my view, we should do that when asylum seekers are disproportionately involved in homicides. That's not the case, as far as we can research it. That's why we decided against reporting. " Opposition politicians have criticized the state broadcaster for its stance in this matter. A few months ago, thegoldwater.com reported a decapitation by an asylum seeker of a German woman and her baby in a Hamburg train station. A few weeks later, it emerged that the German media had ‘forgotten’ to mention this detail. Related coverage: <a href="https://thegoldwater.com/news/34408-Germany-Offenburg-Protests-After-Somali-Refugee-Kills-Doctor-Video">Offenburg protests after Somali refugee kills doctor (Video)</a>. Germany has regional elections in October. In last year’s elections, the rightwing anti-immigrant AfD took 14% of the vote. As if they're gonna show on TV what is really going on in Germany. Next election AfD would get 20%. If they reported accurately AfD would end Merkelreich instantly. These media men are rodents. Putin doesnt invade for the same reason he doesnt kick over a chamber pot.